meat processing | Are there chicken sheds in heaven? Prometheus Books, New York, 1997. You can tell from the title and the front cover that it’s not going to be light reading… no happy endings or sugar plum fairies here.. The fact that we know from the title that this book is going to be deeply upsetting and disturbing tells us everything we need to know about how we really feel about slaughterhouses. A bit like watching Schindler’s List or 12 Years a Slave, you know that reading this book is going to fill you with shame and horror and sadness and anger. But unlike Schindler’s List and 12 Years a Slave, you won’t be able to walk away and tell yourself that you’d have behaved differently and that you’d have tried to stop it. Because you aren’t and you don’t. 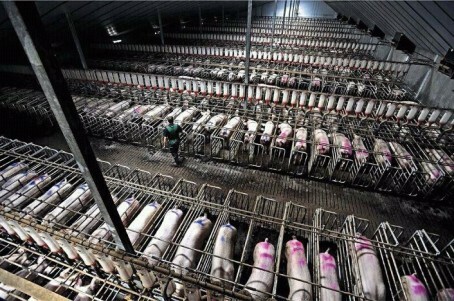 In the midst of our high-tech, ostentatious, hedonistic lifestyle, among the dazzling monuments to history, art, religion, and commerce, there are the ‘black boxes.’ These are the biomedical research laboratories, factory farms, and slaughterhouses – faceless compounds where society conducts its dirty business of abusing and killing innocent, feeling beings. These are our Dachaus, our Buchenwalds, our Birkenaus. Like the good German burghers, we have a fair idea of what goes on there, but we don’t want any reality checks. We rationalize that the killing has to be done and that it’s done humanely. We fear that the truth would offend our sensibilities and perhaps force us to do something. It may even change our life. 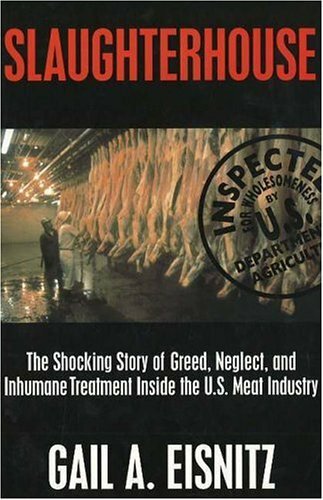 Slaughterhouse by Gail Eisnitz of the Humane Farming Association is a gut-wrenching, chilling, yet carefully documented, expose of unspeakable torture and death in America’s slaughterhouses. It explodes their popular image of obscure factories that turn dumb ‘livestock’ into sterile, cellophane-wrapped ‘food’ in the meat display case. The testimony of dozens of slaughterhouse workers and USDA inspectors pulls the curtain on abominable hellholes, where the last minutes of innocent, feeling, intelligent horses, cows, calves, pigs, and chickens are turned into interminable agony. And, yes, the book may well change your life. Here are some sample quotes (warning! extremely offensive material follows). Then another worker, on cow slaughter: “A lot of times the skinner finds a cow is still conscious when he slices the side of its head and it starts kicking wildly. If that happens, … the skinner shoves a knife into the back of its head to cut the spinal cord.” (This paralyzes the animal, but doesn’t stop the pain of being skinned alive.) And still another, on calf slaughter: “To get done with them faster, we’d put eight or nine of them in the knocking box at a time… You start shooting, the calves are jumping, they’re all piling up on top of each other. You don’t know which ones got shot and which didn’t… They’re hung anyway, and down the line they go, wriggling and yelling”(to be slaughtered while fully conscious). Safety is a major problem for workers who operate sharp instruments standing on a floor slippery with blood and gore, surrounded by conscious animals kicking for their lives, and pressed by a speeding slaughter line. Indeed, 36 percent incur serious injuries, making their work the most hazardous in America. Workers who are disabled and those who complain about working conditions are fired and frequently replaced by undocumented aliens. A few years ago, 25 workers were burned to death in a chicken slaughterhouse fire in Hamlet, NC, because management had locked the safety doors to prevent theft. Slaughterhouse has some problems. In an attempt to reflect the timeline of the investigation, the presentation suffers from poor organization and considerable redundancy. But that’s a bit like criticizing the testimony on my Holocaust experiences because of my Polish accent. The major problem is not with the content of the book, but with the publisher’s cover design. The title and the headless carcasses pictured on the dust jacket effectively ensure that the book will not be read widely and that the shocking testimony inside will not get out to the consuming public. And that’s a pity. Because the countless animals whose agony the book documents so graphically deserve to have their story told. And because Slaughterhouse is the most powerful argument for meatless eating that I have ever read. Eisnitz’ closing comment “Now you know, and you can help end these atrocities” should be fair warning. After nearly 25 years of work on farm animal issues, including leading several slaughterhouse demonstrations, I was deeply affected. Indeed, reading Slaughterhouse has changed my life. I think, deep down, we all know this is probably true. However much we tell ourselves that animals are killed ‘humanely’, after ‘a good life’, and eating meat is, after all, ‘necessary’ etc. None of us are actually comfortable with another animal having to die so that we can have the pleasure of eating it. We happily buy and eat meat but we’d rather not think about the process by which that animal gets from the field to our fork. Most of us would never have the gall to kill a pig, cow, lamb, chicken or duck in order to eat it. Most of us wouldn’t particularly want to bop a tuna over the head with a mallet even! At the other end of the spectrum, even my most hardy farming friends, who’ve grown up ‘culling’, ‘processing’ and ‘butchering’ animals still find the task, however necessary they feel it might be, and however pride they may take in doing it well, an unpleasant one. At a very basic human level, it is never an enjoyable thing to take someone or something else’s life and nor should it be. THERE are meat-eaters who abhor animal cruelty and vegans who are driven by matters other than animal welfare. But, in my case, the two have always been intrinsically linked. I vividly remember being horrified as a 14-year-old given a summer job by my local butcher. Having been led to believe I would be serving behind the counter, I was surprised on my first day to find myself exposed to the slaughterhouse next door. Rather than serving up some prime steak for Mrs Smith or chicken fillets for Mr Brown, my unglamorous job was to feed sheep intestines through my fingers to be used for sausage skin. But if that was unpleasant enough, nothing could have prepared me for some of the other horrors that I experienced on that first day. I saw the fear in the eyes of the animals who were about to be killed. I can still picture that now, just as I can still smell the rank scent of death which filled the air in that awful place. It was an experience that stayed with me for life and something that influenced my eventual decision that I could no longer partake in this industry. I made that choice in 1976, some five years after that dreadful experience in the butcher’s slaughterhouse. I can even remember hearing Spike Milligan discussing his vegetarianism as he was being interviewed on the Michael Parkinson Show. That unquestionably influenced me, too, and may well have been the deciding factor. But, for me, becoming a vegan was less about emulating my heroes or making a statement. It was much more about taking what seemed to be the next natural step, as a 19-year-old who was beginning to come to terms with some of the social injustices that would epitomise much of the next couple of decades. It was an era that shaped the person and politician I became. My ideologies and beliefs were shaped in the late 1970s and early 1980s, and becoming a vegan was part of that. Cruelty seemed inherent within the meat industry. So why would I want to partake in such a thing when I felt so passionately about it? I joined the Hunt Saboteurs Association at around the same time and was elected on to the League Against Cruel Sports’ board of trustees in 1979. It’s a position I still hold with pride. And I’m as passionate now about fighting against cruelty to animals as I was back then. That made it easy for me to take my natural position on debates such as fox-hunting before that was finally resolved by the last Labour Government. It also sheds some light on why I have been such a vocal opponent of the appalling badger cull which remains in place, even if our campaign against it has forced the Tory-led Government to slow its progress. All that is because it is easy to campaign on an issue when it rankles with the belief systems you hold at your very core. I abhor cruelty in any form and the way in which animals are reared has become more intensive, which has inevitably compromised welfare. But there are so many other reasons to believe that eating animals is fundamentally wrong, especially at a time when the earth’s natural resources are under intense pressure and energy efficiency is more topical than ever. Farmed animals consume 13 pounds of grain for every pound of meat produced. Even more perversely, farmed fish need to be fed five pounds of wild-caught fish for every pound of flesh produced for human consumption. It is grossly inefficient and makes no sense whatsoever. In terms of energy consumption, 11 times more fossil fuel is exhausted to make a calorie of animal protein than it takes to make a calorie of food protein. And the livestock industry is responsible for nearly 20 per cent of the world’s climate changing emissions. Add in other alarming statistics, such as the fact that 50% of antibiotics are used to tackle health problems of animals being reared in intensive conditions, and it casts a dark shadow over the whole meat industry. So, while my original decision was about cruelty to animals, there are dozens of other factors that reinforce my view that veganism is not just about morals, but about making a sustainable life choice. Population growth and environmental considerations mean that meat consumption at present levels is untenable. Consequently, the likelihood is that, for future generations, a vegan diet will be the norm rather than the exception that it is today.